...is run by the inimitable Lady Dolores Bourhardie who is a firm believer in the sacred matrimonial institution. She also believes in herself as high priestess of advice to the unhappy wed who are on the middle-age brink of being lured into extramarital infidelity. She has reason; her paper's circulation has increased four fold. Her concern extends to a brooding passion for the destruction of one Septimus Tuam, Beau Brummel of London suburbia whose seductive enticements have turned many a dainty hand to write a tearful note to our lady, who decides that "only innocence can match the black heart of Septimus Tuan." Enter innocence in the form of one Edward, a man once driven to a monastery by the billboards of civilization. Edward, truly pure, is looking for maturity and a job. He is assigned to track down the elusive Tuam and eliminate him by threat or logic. Meanwhile, back in the boudoir, Septimus the snake is eyeing Eve the typical middle-class matron. Eve's husband James watches the marriage dissipate and dreams of a new, more romantic life. Septimus envisions new conquests, more money. Round the marriage-go-round goes played to a tune of muted farce. 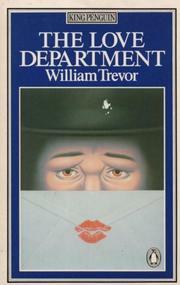 Mr. Trevor (The Old Boys, The Boarding House) is a superb stylist, blunting the comic edge with a touch of moral concern. He is adept at handling dinner-party prose and cocktail party caricatures. But he inspects rather than dissects, handling his situations at arm's length and, one would suspect, with nostrils pinched. The result is that the book becomes a trifle tedious. Nevertheless Mr. Trevor has wit, talent, and a claque.